Well, better late than never, I suppose. And yes, there are spoilers for both the LOST finale and Harry Potter. I did watch the LOST finale on Sunday night. In retrospect it was quite possibly the worst way to spend one’s 40th birthday–all ruminating about death and loss and The Meaning Of It All. And even worse for me…coming away without a bundle of answers. What I came away from the LOST finale with was this: Their lives were lived on two tracks at the same time. Picture a vinyl record with multiple songs layered from the outer rim to the center. Each song is its own entity and exists alongside the others. 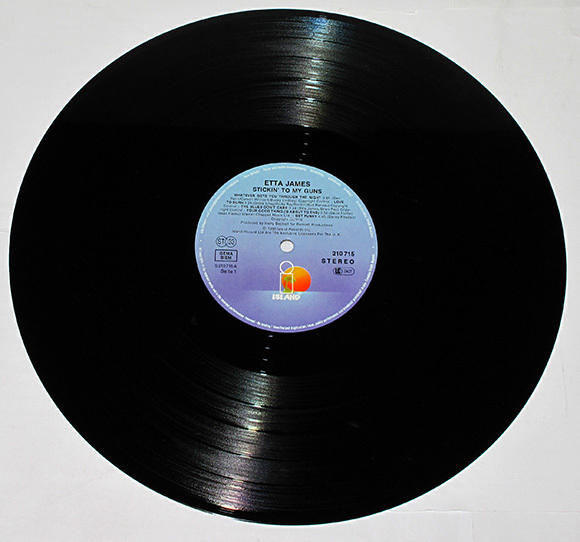 As the different songs get closer to the center of the record they have less of a distance to revolve so they must either widen to take up the same length of song time or the song must be shorter. Track 1: The Island, The Crash, The Candidates. Track 3: This is the shortest track. I believe it begins FOR JACK when the concert is over. At that point a version of Kate is there to take him into the chapel. He’s dead. In the Flash Sideways world perhaps he was in a car crash on the way to the concert. Who knows? It doesn’t matter because his narrative in both worlds ends at that point. Everyone else is in the chapel but we have no clear idea of what point they left the other two tracks. So it’s entirely probable that Sawyer and Juliet dated, married, had babies and died 40 years later, coming to the chapel with both their versions of Track 1 and 2 were played out. Likewise Hurley and Ben were most likely on the Island for who knows how long. Could be 100 years. Since Track 3 is its own song it exists on its own time frame and doesn’t depend on the notes and lyrics of the first two tracks, even though the singer and the band are the same. In its six seasons LOST came to remind me of a stoner friend I used to have years ago. Dude is now in a mental hospital (a la Hurley) but before he reached that rocky end he would sit around high on paint thinner or pot or whatever and trip himself out with ‘freaky’ questions. Whenever you were around him you’d hear him say ‘oooh, freeeekeeee, man’ over and over. He’d never follow his thoughts’ trails to a final place, and preferred to just linger on the trippiness of it all. He was and is the main reason I’ve never been one to go in for drugs or drink as a form of recreation. Because while he was content to hang out at the “Whoa!”, I had to move down the road to the “Why”. And LOST, for all its easter eggs and philosopher names and putting a liberal arts education to the test, was firmly stuck in Whoa! for most of its run. I knew that and had made my peace with it. So I guess I wasn’t really thinking we’d get too many answers. But what I wasn’t expecting was for the Big Conclusion to have been pretty much ripped off from the King’s Cross chapter in Harry Potter and the Deathly Hallows. First we start with Dead Father Figures gently breaking the news to their ‘son’s about the younger man’s recent death. In DH it’s Dumbledore talking to Harry, who has recently sacrificed himself to save the world from the unleashing of evil forces. In LOST it’s Christian Shepherd talking to Jack who has…etc. Christian Shepherd in describing the ecumenical chapelnacle where the two dead men: “This is the place you made together” i.e., it’s been created in their collective minds as a meeting place. Dumbledore in describing the King’s Cross train station: “This is, dear boy, as they say ‘your party’.” i.e. the choosing of place was in Harry’s mind. In both cases there is much talk of remaining and going on and the nature of death as something not to be feared but accepted as the next stage of the journey. Of course I think it was all handled much better by Rowling in DH. I love those books because underneath the ripping yarns, JK Rowling has always been a Why author. I am hardpressed to think of one question raised over the course of the seven-book series that wasn’t answered in the course of the telling. She wove those stories and the philosophy underpinning them painstakingly. What we’re left with in the case of Harry Potter is a shimmering mosaic tale which illuminates the struggle of life and the acceptance of death. There are no cheap thrills in Harry Potter. No four-toed statues or smoke monsters designed to give us chills with no answer. And after all, when you’re ruminating about the nature of death, isn’t that the better course? It both LOST and Deathly Hallows the newly dead hero questions the reality of the circumstances only to be told that just because something happens in one’s head doesn’t mean it isn’t real. As a lifelong reader and author who lives largely in her own head, that had special significance for me when I first read it. I felt as though Rowling gave us all a gift of understanding by embracing the nature of thought realms. Any reader knows how real a story becomes as it decorates her mind. But when Christian Shepherd said pretty much the same thing to Jack I felt cheated…not only because it seemed to be so stolen from the Potterverse but also because it seemed to serve as a stopgap, designed to prevent the authors from coming up with better answers. Still…Where Did The Lighter Fluid Come From? Oh my gosh. This might go down in history as one of my weirdest weeks ever. Even more…what’s so weird about it is that it’s only a quarter-bubble off plumb. It’s not weird like it would be if something (God forbid) blew up or burned down. It’s just weird because the rhythm of my days has shifted, along with the tenor of the household. And I’m soooo bad at dealing with change. Not as bad as the people working at the new Burger King down the road, but that’s a story for another time. The hole seems filled by Gob. More than filled. This dog is crazy, which of course means he fits right in. He blends in, too. And by that I mean that he is None More Black. You can’t see him if he chooses to slink off into the shadows. We have always kept our home dimly lit, partly out of allegiance to our hippie-green ideals of 20 years ago and partly out of a preference for soft, indirect lighting. This of course means that we are going to be going out this weekend and buying a flourescent dog shirt so that I don’t keep almost stepping on the critter. I did try to live most of late Monday and into early Tuesday with all the overhead lights glaring down, but that made me feel like I was undergoing some sort of PsyOps new-wave alt torture. And if anyone’s gonna suffer it’s gonna be Gob. Bright yellow and green doggie shirts, here we come! How this will bode for his hunting efforts is another question. Apparently Schipperkes are avid vermin hunters. We, being relatively clean people overall (if we live according to husband’s diktat instead of wife’s lesser nature), haven’t any real rodents to speak of. 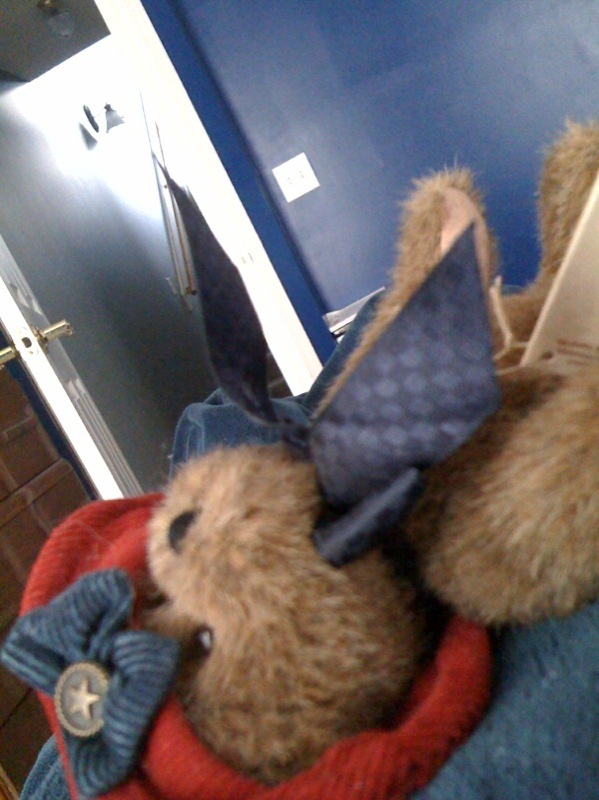 Yet as I lay reading in bed yesterday I was presented with a tiny Boyd’s Bear, it’s neck turned to “broken” position. Gob laid it carefully on my stomach with a look that said “there. I killed it. It will bother you no more, my lady. Thank me later! I’m off to slay more infidels! !” I promptly made sure all other stuffed tokens of love from spouse, mother-in-law, sister and others were up high enough to escape his whacky dilligence. What I didn’t bother checking was under the bed. Now, in fairness to us, we have a king-size Tempurpedic bed. They’ll tell you it’s made out of space foam, but it’s really made out of some rare heavy metal that can’t be moved without a forklift. So if something goes more than say six or eight inches under the edge it usually just stays there until I start missing an old book I just have to re-read and frustratedly grab the Swiffer from the laundry-room to swoop the book out, along with the usual mateless socks, missing heating pad and random punch card from Sweet Cece’s. While reading today I heard a strange slithering. I decided to ignore it and drifted off to sleep. (Meds.) When I woke up about 20 minutes later there were no fewer than nine old dog toys, three socks, a handtowel and a postcard from Prague all laid out triumphantly. Young Indiana Jones was gnawing on one of the rescued dog toys happily satisfied with his good day’s work. They say life begins at 40. If so, my life is definitely beginning on one of the oddest notes ever. Because I Am Not Racist. “Gob” was sort of one of those names that fell in our lap. We first said it as a joke and then realised that it was just the right name. It just…fit. One of the other names I’d thought of, fleetingly was “LLUA”. We’d pronounce it ‘lew-uh’. I mentally rejected it because it sounds feminine and I didn’t want to have to explain to everyone what a Little Lebowski Urban Achiever was, nor why I gave that name, thoughtlessly, to a black dog. it was just a bit too skeevy. And of course I rejected “Dude” and “Bowski” immediately. Both of those names are way over-used. Besides, they conjure up pictures of pot-addled doofi who long ago smoked away the more creative parts of their brains and now are followed through life by a bedraggled terrier who sometimes gets to drink beer out of his water dish. One of the greatest things about Gob is his housebrokenness. 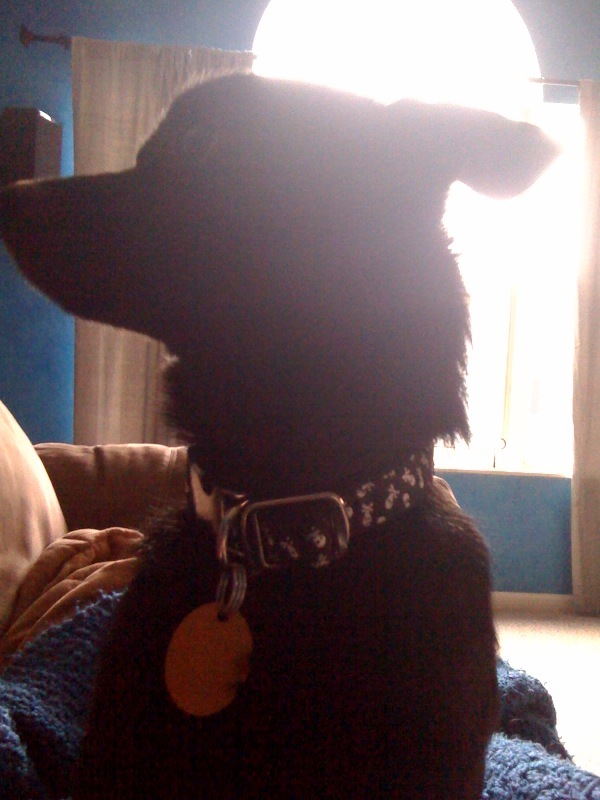 When you adopt a dog who is young, cute, smart AND already knows ‘outside’….my friend, life has handed you a gimme. No two ways about it. The Kimber’s Kritters woman told me that he wasn’t housebroken but that they say that about all their adoption dogs so that nobody brings it back in frustration when there’s the first accident. So we had no idea he was potty trained until we got home to go through the first steps of the routine and got this “yeah, yeah, I know the drill” look. It was AWESOME. But I did know this day would come. It’s inevitable with a new dog; a boy dog who has just been neutered. He did, when freaked out by the storm, pee on the rug. Which makes me think that just for today I want to call him Chinaman. So badly. I have a few different posts I want to write, but I can’t settle on any of them. Should I write about Gob and his mysterious origins, hacking cough and funny personality? Should I write about the state of the Church in America? Should I write about how certain people turn up time and again in your life like Herpes? I really can’t make up my mind. And I’m tired. One of the good things about taking care of Gob and his many little needs is that I am dead certain I would have been a good human mother and/or a passable nurse. I like to take care of people and animals. So it’s reassuring in its own way. God didn’t pass me by with children because I was a slacker in the momability department at least. I am tired though. I skipped meds this week so that Gob’s first week here would be less odd for him. I mean, it’s got to be odd enough already when some big fat white guy keeps trying to hump your face. Watching your caretaker sleep all day would just be pushing it. Nevertheless, I’m still tired. He’s got a hacking cough that is either allergies or a cold or kennel cough. What it is doesn’t matter at this point according to the Vet because they’re all treated the same way. So I’ve been sitting in steamy bathrooms with him and forcing warm honey and hydrogen peroxide down his throat in between benedryl dosings. It’s kind of funny in a way because Gob’s first days are very similar to Casey’s last days. They are measured in dosing times and trips to the yard. But who wants to read about someone else’s dog’s snot? Nobody, I reckon. So why did I spend all this effort on this post? I guess it’s because I’m tired enough from being up all night that I can’t write those other posts with anything even vaguely close to tact. And since I am already being reamed out in one set of comments I don’t feel like opening myself up to that. So instead of poking those pythons I’ll just ramble on about my dog’s cough as though that makes it interesting. But that’s the thing about this dog that is similar to getting guff in the comments section of your blog. Getting a rescue dog is, essentially, being willing to take on someone else’s junk. Now don’t get me wrong. I love Gob and I know we made the right decision and this is the right dog for us. But I also know that he’s afraid of closed doors and freaks out whenever I emerge from the bathroom. He came to us half starved, more a hair-covered skeleton than a dog. It’s like having a blog with comments. You take the good with the bad and hope you don’t catch something deadly. Oh, To Be A Goldfish! That was one of the first things to go, coming along about the time I started getting those first warning tingles in my littlest toes. For the longest time I didn’t care about it being gone at all, so focused was I on the unremitting pain. But as the pain as gradually been more controlled, I have more and more days where I mutter under my breath as I leave yet another note for myself in my iPhone. Now, though? Now I’m starting to think that memory is a poisoned cake. It may lure you in with sweet, tangy sponge and icing thick with butter, tiny bits of sugar puckering your teeth. A few bites, though, and the ache cuts so deep within your heart it feels as though your soul swallowed diamond coral. I watched as Gob sniffed the wet grass looking for all the new things here in his new life. Beside his wirey whippet youngness Quinn looks suddenly ancient, packed under a welter of years. I can’t help but remember ten summers ago–ten! !–when the last new puppy sniffed around our place to get to know its barriers. Casey and Quinn were the wirey whippets dashing merrily around the place and making us laugh with their enthusiasm. We all played games of chase together. Now I sit, aching and lame, watching one dog now tiptoe across the grass he knows so well, grass that has been his alone in the two years since his brother went on. The other dog has done nothing wrong, other than be young and new and accidentally brush the places in my mind I’d rather not go. It’s not his fault. I’d rather he be here learning our yard than waiting in a concrete cell for a death sentence that was also no fault of his. But at the same time I wish that there were a way to not have so many of the good memories also hurt so bad. I was initially going to say that I wish I, like goldfish, had no real memory to speak of. Then I realised all that I would lose. I could say goodbye to the first time I looked at a Richard Scarrey book and realised that I knew what all those black marks meant. I could no longer visit the first time Tommy was old enough to walk at Disney World and was so enchanted by Small World. I’d have to forget the purple pinata at my tenth birthday party and the nine hour, all-night conversation in the 70s-era paneled apartment where I fell in love with my husband. I don’t want to lose those things. But at the same time I don’t want them to hurt either. Won’t Heaven be a tremendous place?!? No more sorrow, no more crying, no more pain! What a promise! I know that life will be eternal, but I wouldn’t mind if it lasted only one day. A day without any of those things would be the greatest gift. A few months ago my sister-in-law called my husband at work with some good news. They were adopting their fourth child, an African-American girl named Naomi. They’ve already adopted three other children, two of whom are also whatever the correct term for darker-skinned- than- caucasian is today. About a month ago my cousin Matt and his wife Abby (who I’m always confusing with my nine year old niece Abbie when the family tells anecdotes) adopted their second daughter. Olivia joins an older sister Hannah, and both girls are Black/African-American/Babies Of Colour/Someone Help Me Out Here. So anyway, we decided we didn’t want to be left out. So yesterday my husband and I adopted a black baby of our own. 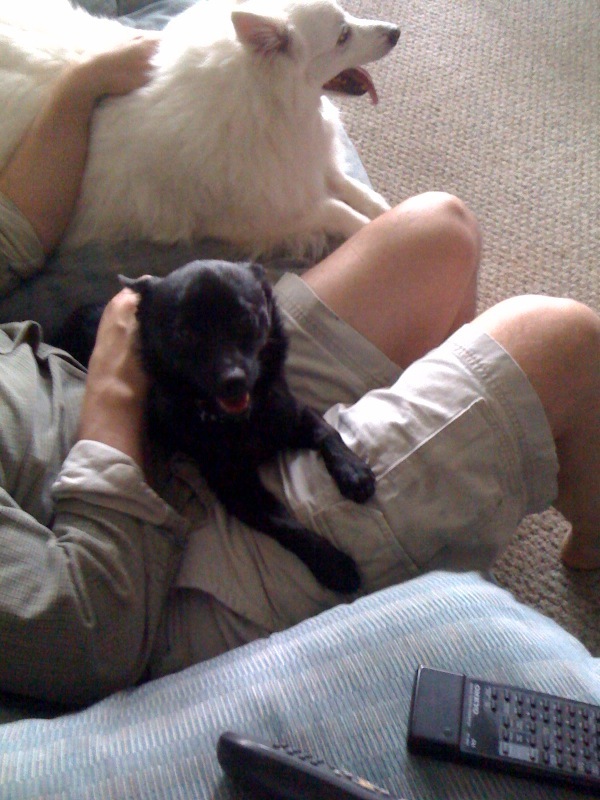 Gob is a one-year-old Schipperke rescue; he was saved from a kill shelter by Kimber’s Kritters. We’ve been talking about getting a second kid for awhile now. Quinn needs a brother. 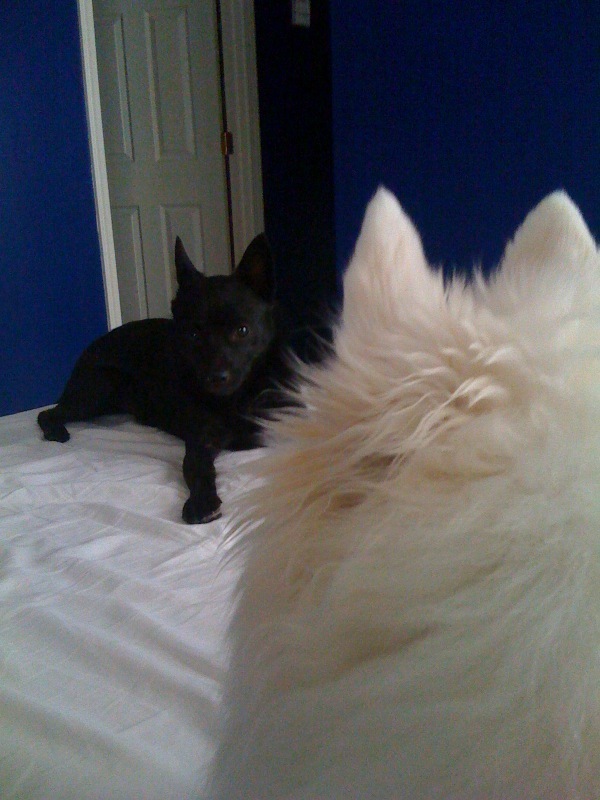 But we’d been all along figuring we’d get another Eskie like Quinn, since we love the breed so much. I’ve been scouring PetFinder and the classifieds for several months and put our names on some Eskie rescue lists. Then today we decided to go to Burger King and stop at the PetCo adoption event on the way. We were assuming that we’d just play with the little homeless critters for awhile and then go eat. And there he was. A dog that looked like a black little homuncular Quinn! 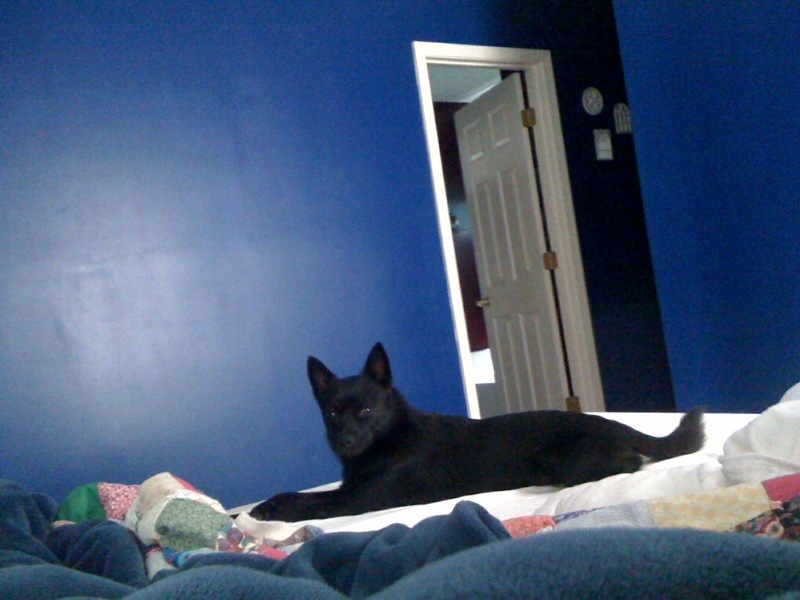 I should say right now that I’ve always wanted a Schipperke, but the spouse was not on board with the idea. But when he saw Gob standing there with that I’m-Smarter-Than-All-Of-You look on his face, a look we know so well from years of Quinn, we knew that our family member had found us. Proof that God knows better than we do–our main concern was my health. Could I care for a new, young dog who needed broken in? That was one of the reasons we waited until Summer. (I tend to be a bit better in the warmer months, as cold aggravates the rheumatic conditions.) Lo and behold, Gob seems for all the world to be house-trained. He knows “Come” “Up” “Down” “Outside” “Inside” “Go Potty” and has proven to be a quick study for the word ‘treat’. Of course. So God has provided us with a wonderful little boy with the exact temperment we so love–smart, individualistic and loving–who is young enough to be bonded into the family easily yet old enough to be over the hardest stage of puppyhood. What a treat!